Caitlyn Miller joined Assure in 2017. She trained with Avalon Beauty College, completing her Diploma in Beauty Therapy in 2012. She holds a postgraduate Diploma in Dermal Therapies from the Australasian Academy of Cosmetic Dermal Science, where she also attained a Certificate in IPL/Laser Safety. Caitlyn is trained and experienced in all areas of dermal therapy offered at Assure, with a particular interest in medical skin needling, IPL, and correcting pigmentation, acne and acne scarring. She enjoys devising customised treatment plans, with therapies and cosmeceuticals tailored to suit individual clients. Jenna Farac joined Assure in 2018. She trained at the International School of Beauty in Perth, completing her Certificate IV in Beauty in 2011. She holds an Advanced Diploma of Cosmetic Dermal Science from the Australasian Academy of Cosmetic Dermal Science, which she attained in 2012, as well as a Certificate in IPL/Laser Safety. Jenna enjoys working with clients with varying types of skin concerns. She strives to ensure her clients are fully informed and have a complete understanding of the personalised treatment plans she tailors for them. She has a particular interest in medical skin needing as it can be used to treat a wide range of skin issues, suitable for all skin types, and consistently provides outstanding results. Anna Matic joined Assure in 2009. She trained at the International School of Beauty Therapy in Claremont and later completed a postgraduate Diploma at the Australasian Academy of Cosmetic Dermal Science and Curtin University. She holds a Level 5 Diploma of Beauty Therapy, including CIBTAC and CIDESCO International certificates, an Advanced Diploma of Cosmetic Dermal Science, and a Certificate in IPL/Laser Safety. Anna has a particular interest in advanced anti-ageing and corrective treatments. She is highly trained and experienced in all non-surgical cosmetic treatments offered at Assure. To read more about Anna, including some inside secrets about her favourite skin treatment, click here. Rebecca Bryant joined Assure in early 2017. She has extensive experience as a makeup artist with MAC Cosmetics and has trained at the Australasian Academy of Cosmetic Dermal Science, where she obtained an Advanced Diploma of Cosmetic Dermal Science in 2018, as well as a Certificate in IPL/Laser Safety. 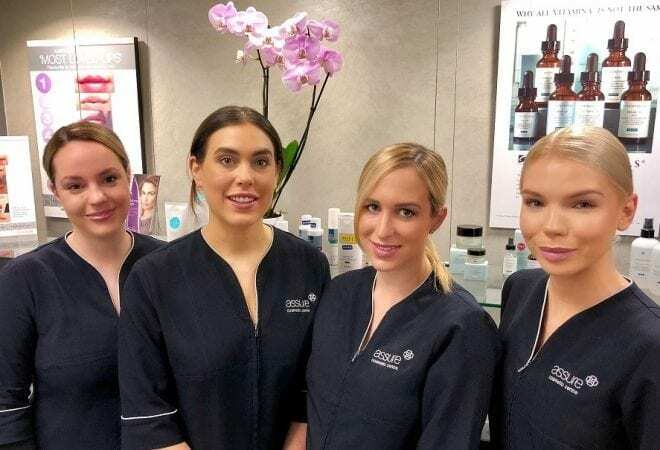 Rebecca chose to become a Dermal Therapist when she realised how little her makeup clients knew about available treatments and products to correct their skin concerns. Rebecca is passionate about long-term skin health, with a particular interest in chemicals peels, medical skin needling and IPL as corrective and preventative treatments for pigmentation, active acne, acne scarring and anti-ageing.